I enjoy still lifes though I have not done them lately. But I didn't know what I wanted to do in art class last night. And it turned out Christina had had a workshop on florals at her studio over the weekend, and still had a bunch of floral still lifes set up around the studio. 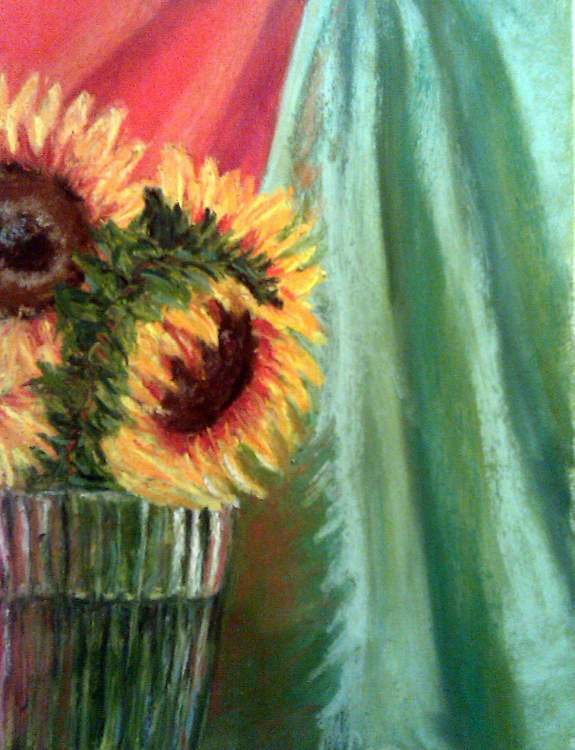 One of them was this vase of lovely big sunflowers, so I decided I'd try to paint them. Most of us in the class work from our own photos in the studio, but last night three of us decided to do floral still lifes. One of the other women did the sunflowers too. It will be interesting to see how hers turns out. Mine was done on my usual 9x12 Art Spectrum Colourfix paper.